Integration between iOS devices and Arduino has never been so easy. No registration, no cloud. Everything under your control. What's IoT without security? Arduino Manager encrypts data transferred to and from the boards. The app shows a grid and tapping on it you can insert specialized widgets to send and receive information from Arduino. Some of the Widgets are also available as Today Widget, so you can get information from your Arduino board quickly and easily. ➤ Gauge Widget: This widget shows an analog value coming from Arduino, moving a needle over a graded scale. The user can customize the minimum and maximum values and separately configure each green, yellow and red region. Double tap on it for the configuration. ➤ Centered Gauge Widget: This widget shows an analog value coming from Arduino, moving a needle over a graded scale which is zero centered. This means that the widget can show positive and negative values. The user can customize the maximum value and separately configure each green, yellow and red region. Double tap on it for the configuration. ➤ Bar Widget: This widget shows an analog value coming from Arduino, turning on LEDs on an horizontal bar. The user can customize the minimum and maximum values and separately configure each green, yellow and red region. Double tap on it for the configuration. ➤ LED Widget: This widget shows a Led that can be turned on and off through digital values from Arduino. Double tap on the Led Widget to change LED color. ➤ Switch Widget: This widget sets a digital value to Arduino. ➤ Rotary Switch Widget: This widget sets a digital value to Arduino. Double tap on the widget to operate it. ➤ Switch & LED Widget: This widget is the combination of the two previous widgets, to save space when they are used together with the same variable. Double tap on the LED Widget to change LED’s color. The LED is turned on and off with messages from the board to show exactly the status of a digital value on the board. ➤ Secured Switch: This widget is aimed to operate critical devices since it can't be operated by mistake. To operate the switch, double tap on the widget to remove the security protection. ➤ Push Button Widget: This widget temporarily sets a digital value to Arduino. Double tap on the Push Button Widget to change the button color. ➤ Secured Push Button Widget: This widget is aimed to operate critical devices since it can't be operated by mistake. To operate the switch, double tap on the widget to remove the security protection. ➤ Secured Push Button Widget: This widget provides 4 direction buttons. ➤ Knob Widget: This widget sets a non-digital value to Arduino. ➤ Slider Widget: This widget is analogous to the Knob Widget but with a different user interface. ➤ Graph Widget: This widget graphs values coming from your Arduino (i.e. Temperature). Double tap on it to zoom it in and change values range. ➤ Logged Data Graph Widget: This widget graphs up to 5 values logged onto the SD Card attached to Arduino. Double tap on it to zoom it in and then refresh values. iOSController library and iOSControllerWiFi library have helping functions to log data onto the SD Card. ➤ Alarm Widget: This widget configures an alarm on the Arduino board which is then fired at the desired time. The alarm is fired even if the iOS device is not connected and retained across power off - power on cycles. ➤ Joystick Widget: This widget allows controlling an external device in two dimensions by the means of your finger. Tapping on it, you can enlarge the controlling surface to have a better resolution. ➤ Sound Alarm Widget: This widget sounds an alarm each time the associated condition is verified. Double tap it to configure the condition and the alarm to sound. ➤ Threshold Widget: This widget allows setting a threshold to the Arduino board (e.g. the room temperature under which the board has to start an heater). Double tap on it to set the threshold's range and its actual value. ➤ Thermostat Widget: This widget allows setting a lower and an higher threshold to the Arduino board to ensure that an analog value remains in the range defined by the two thresholds. It also shows the actual value of the related analog quantity. ➤ Console Widget: this widget helps the user to debug the Arduino code, receiving and displaying debugging messages. ➤ iBeacon Widget: tracks the position of your iOS device with respect to an iBeacon and communicates to the Arduino board when iOS device is getting into and when is getting out the iBeacon region. If you have not an iBeacon device, you can buy my BeaconTx app to transform your iPhone or iPad in an iBeacon. ➤ USTREAM Widget: This widget shows a video stream coming from the USTREAM site (http://www.ustream.tv). You can publish there your own on-line streams. ➤ Color Picker Widget: This widget allows the user to choose a color and its brightness. The corresponding RGC values are sent to the Arduino board. Double tap on the widget to operate it. ➤ Accelerometer Widget: This widget shows the acceleration by the means of a ball’s displacement along three axes. Double tap on the widget to see it larger. ➤ Gyroscope Widget: This widget shows the rotation speed by the means of a pyramid’s rotation along three axes. Double tap on the widget to see it larger. ➤ Bubble Level Widget: This widget shows if a surface is horizontal (or vertical) through the displacement of a ball along two axes. ➤ Web Widget: This widget shows any web page you need. May be used for integrating external services or devices like video cameras. ➤ GPS Widget: This widget continuously sends to Arduino latitude and longitude of the iOS device. ➤ Twitter Widget: This widget allows to sends personal messages via Twitter. A Twitter user name, a threshold value and a message can be set. When an Arduino programmed condition is met with that value, Arduino sends a personal message to the predefined user. Each widget is associated with a variable (i.e. T), which is either written or read by the sketch running on the board. In this way the iOS app can receive information from the Arduino board or control it. Moreover, the user can easily manage different lists of widgets and switch among them in order to control different boards and/or projects. User can share widget configuration between own devices and/or other users, through an email message. When the Edit switch (bottom left side) is Off, user cannot add, delete or move widgets. Three Arduino libraries (iOSController, iOSControllerWiFi, iOSControllerBLE) are available to easily integrate your own projects with Arduino Manager. PLEASE NOTE: Ethernet Shield and Ethernet Library or WiFi shield and WiFi Library or RedBearLab BLE Shield and related libraries ARE REQUIRED IN ORDER TO USE Arduino Manager. Twitter Widget not supported Alarm Widget supported, SD Widget and Logged Data Widget supported with SD Card reader. Shield not required,, Ethernet built-in. Shield not required,, WiFi built-in. Due Alarm Widget not supported. Library is not officially supported. Ask for it. Everything should work with Edison too, but not tested. RFduino - - - - - Additional board not required: Bluetooth BLE built-in. Alarm Widget, SD Widget, Logged Data Widget and Twitter Widget not supported. Teensy3.1 - - - - Alarm Widget, SD Widget, Logged Data Widget and Twitter Widget not supported. - - - Alarm Widget, SD Widget, Logged Data Widget and Twitter Widget not supported. Everything should work with 3.2 too, but not tested. 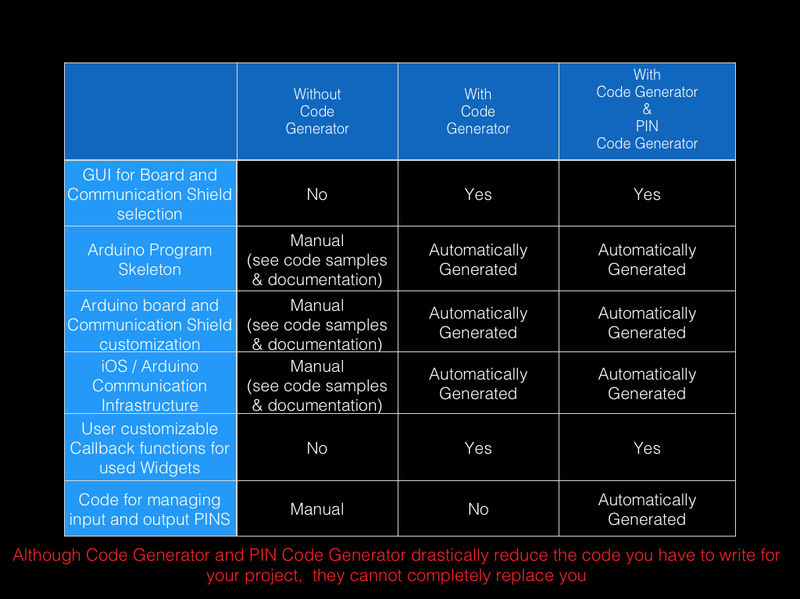 Code Generator: allows the user to generate the communication infrastructure between the Arduino board and iOS device and generate the code for each chosen widget in order to simplify the programming effort on Arduino board. All this in few steps. PIN Code Generator: allows the user to associate a pint to each widget and generate the code to manage that pin. In most cases this avoid writing any code. Please, follow the instructions in the documentation downloading the needed libraries here. They are installed together with the libraries. "Grazie Mille for the excellent app! I had everything running in only a few minutes. This saved me a tremendous amount of time. ... I'm building a high-altitude drone for photography. It's controlled by gas jets and will fly to 30Km altitude. I am using the Arduino Manager to control test equipment inside of a vacuum cryogenic chamber (simulation of 30Km atmosphere conditions). Thanks again! Chris"
"Arduino manager is the greatest arduino app ever created! Customize the controls and sensor feedback with ease. The code and pin generator are a priceless time saver that make sketches a breeze. I have learned a great deal about writing code from seeing what the code generator creates. For anyone getting started with arduino, as well as the veterans of micro processing, this app is a treasure. (Randy M Erskine - Selberg Studios)"
If you like your project to be listed here, please, send me an em. All content copyright © 2010-2018 - Fabrizio Boco otherwise noted.